A country house. A missing man. A family with secrets. A dead body. An amateur investigator. All the ingredients of your basic Golden Age murder mystery. 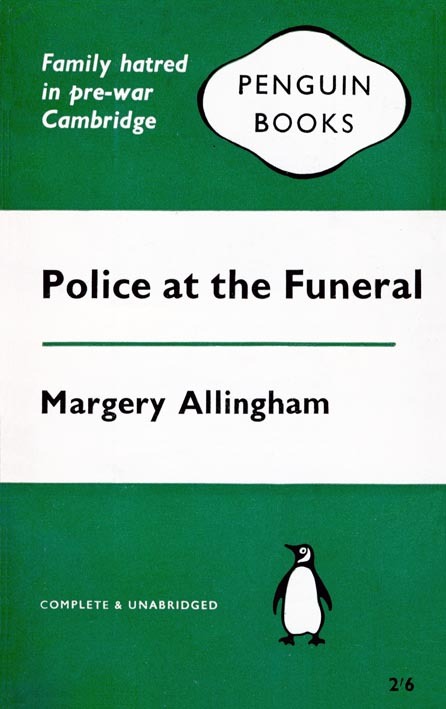 Published in 1931, Margery Allingham’s fourth Albert Campion novel, Police at the Funeral, is very much in the Golden Age tradition, perhaps even more so than the previous two novels, but I get the sense that Allingham is having fun playing with reader expectations. I’ve noticed before that the Campion books are as much adventure stories as they are mysteries. The ones I’ve read did have a murder to be solved, but I wasn’t convinced that the readers were given the information needed to solve them. There was no meticulous laying out of clues or suspects, just lots of exciting happenings tempered with dashes of Campion’s particular sort of silliness. In this book, Campion outright says that he’s not a private detective but a “deputy adventurer.” If this is an admission on Allingham’s part that her novels aren’t quite proper detective fiction, it’s interesting to note that this book is far more traditional a detective story than the two previous. There are clues and suspects and a scene in which the detective—er, adventurer—holds forth on how he solved the crime. I doubt most readers could solve the mystery here, but this is the first Campion novel in which I think we’ve been given a fighting chance. The mystery involves a family that lives in a country house near Cambridge governed by the formidable great-aunt Caroline. Among the residents are Caroline’s son William, her daughters Julia and Catherine, her nephew Andrew, and Catherine’s niece by marriage, Joyce. Joyce is engaged to Campion’s old friend Marcus, so when Andrew goes missing, they ask Campion to help. In the fashion of so many detective novels, bodies begin to mount up as the suspect list dwindles, but the resolution doesn’t seem to get any closer. Campion himself isn’t much help to the reader—or to the police. It’s clear that he figures things out long before they’re revealed, but the reader is only rarely privy to his thoughts. We do, however, get most of the information that he has, which is why I say we’re given a chance to solve the mystery. A large part of the appeal in these books is in Campion himself. I’m a complete sucker for the character who is deeper and more intelligent, strong, and intense than he appears. (This quality is at the root of most of my fictional character crushes.) Campion intentionally sets himself up to be underestimated. He wears enormous horn-rimmed spectacles that make him look less intelligent—one character observed that “without his spectacles his appearance had gained at least 50 percent in intelligence.” He puts on a mask of “affable stupidity” to ease his nemeses into complacency before he snaps into action if needed. And when he snaps, look out! I appreciated in this book that we could see how seriously he takes his work. He seems genuinely disturbed by some of the events, a feeling that was not so much in evidence in The Gyrth Chalice Mystery, where he was mostly having fun. I’m planning to continue reading these in order, and I’m excited to see how he continues to grow. This entry was posted in Drama, Mysteries/Crime. Bookmark the permalink. I’ve been a huge fan of Albert Campion since my mother introduced me to him when I was thirteen, and I’ve re-read most of these over the years. Look forward to hearing more of your thoughts and thanks for the reminder. I read a few of the Campion books many years ago and enjoyed them, but they didn’t stick with me. But I think this chronological approach will help me get a better handle on the character and he’ll stick with me more. I’ve never read Margery Allingham, but her “Crime at the Black Dudley” is on my 2012 reading list. I’m looking forward to meeting Campion! I haven’t been able to get my hands on that one, so I ended up skipping it. My understanding is that Campion himself is a minor character in it, so I’m hoping I didn’t miss too much. I love Campion and I enjoyed this – I’ve read it a couple of times. My two very favourites though are The Tiger in the Smoke and the very early (in fact I think almost juvenilia) White Cottage Mystery (no Campion in that). Tiger in the S. has my favourite ever literary portrayal of a vicar. Not a category I’d ever envisaged having in my mind, until I read Tiger. Tiger in the Smoke is the one where he has amnesia, isn’t it? That’s the only one I’m absolutely sure that I read when I tried Allingham years ago. I know I read one or two other then, but I have amnesia about those! Oops! I just found this piece by A.S. Byatt, which tells me that the amnesia one was Traitor’s Purse. I still think I might have read Tiger in the Smoke too because the title is so familiar. You know I’m a sucker for Golden Age mysteries, but I’m not familiar with this author. It also really sticks in my craw when authors feel they have to make their plots mysterious simply by withholding information from their readers… I think the best ones are able to have everything out there but still throw you for a loop. Perhaps as Allingham gained greater confidence in herself as a mystery author she started to give her readers more of a chance to play sleuth alongside Campion? She’s one of the Queens of Crime, so worthy of interest to any Golden Age fan. I get the impression that she’s not read much anymore–certainly not as much as Christie and Sayers—I think some of her books are out of print. I don’t ever put a lot of effort into solving the crimes, so withholding of clues won’t ruin a mystery for me, especially if, as is the case with the earlier Campions, they feel more like adventure stories with a crime-solving central character. However, I agree with you that the very best mystery authors play fair and lay all the clues out there. I’ve only read this one once, and I remember struggling with it, compared to the more light-hearted ones I’d started with. I’m curious now to re-read it (especially since I can’t remember anything of the plot!) and see how it goes this time. This doesn’t have nearly the sense of fun that Gyrth Chalice (aka Look to the Lady) did, but I enjoyed it. I understand that some of the later books get quite dark. I’ve never heard of this author before or this series but it sounds like a fun one to try. If you like Golden Age mysteries at all, you should look for her! I’ve read several of the Campion mysteries and he is indeed a very quirky but interesting character. I went back to start at the beginning as I had read a few of them out of order and was just thinking I need to get back to them. It would be interesting to read about Allingham–didn’t she give up mystery writing for other sorts of writing? She sounds just as intriguing as her character! I hadn’t heard that about Allingham, but I’ve read next to nothing about her life, so who knows? I know that Dorothy Sayers did a lot of other writing–some works of theology and a translation of Dante.